Corresponding author. E-mail address: l_shijun@hznu.edu.cn (S. Li). The importance of anion recognition in biochemistry, medicine, catalysis, environmental science and other fields, has been the impetus for the design and fabrication of artificial anion receptors [1-9]. According to the electronic property, the anion receptors can be classified as Lewis acid centers [10-12], positively charged receptors [13, 14], and neutral receptors [15-19]. Among them, the neutral anion receptors have attracted great attention due to their high specificity of binding anions via hydrogen bondings, as which are observed in natural proteins to regulate the transport of anions through cell membranes . Although various non-biological anion receptors have been reported over the past decades [1-9, 20-23], the neutral receptors having strong binding ability with anions are still rare. Urea is a kind of favorable functional group for the construction of neutral anion receptors as it is apt to form hydrogen bondings with anions [24-27]. As single urea unit cannot bind anions strongly enough, the simultaneous introduce of a couple of ureas onto a host can greatly improve the binding ability of the receptors . Herein, we reported the design and synthesis of a kind of tetraureaappended porphyrin-bottomed anion receptors based on the α, α, α, α-H2TamPP (meso-tetrakis(α, α, α, α-2-aminophenyl)porphyrin, 1) derivatives [29-34], as well as the recognition of these receptors toward a variety of anions, including F-, Cl-, Br-, I-, NO3-, HSO4-, and AcO-. The four ureas and the porphyrin plane of the receptors circumfuse a pocket, which is quite suitable to accommodate anion guests. The complexation between these tetraurea receptors and anions was investigated by using NMR spectroscopy, mass spectrometry, microcal isothermal titration calorimetry (ITC), and single-crystal X-ray analysis. As shown in Scheme 1, the porphyrin-derived anion receptors with tetraurea moieties were synthesized from α, α, α, α-H2TamPP (1), the α, α, α, α-isomer of meso-tetrakis(2-aminophenyl)-porphyrin, which was prepared according to the literatures [35, 36]. Anion receptors 2–4 were provided in yields of 76%–83% by the treatment of α, α, α, α-H2TamPP with 8 equiv. of the corresponding aromatic isocyanate (a–c) at room temperature, and purification by flash column chromatography and then recrystallization from a mixture of CH2Cl2 and MeOH (The detailed experimental procedures are given in Supporting information). The introduce of electronwithdrawing groups, such as pentafluoro, 4-ethoxycarbonyl, and 2, 3-dichloro, onto the phenyl groups that attached to the ureas are expected to increase the acidity of N-H of ureas, which is conducive to complexing with anions. Tetra(n-butyl)ammonium salts of the anions, including F-, Cl-, Br-, I-, NO3-, HSO4-, and AcO-, were used for binding investigation. The complexation between the receptors and anions were firstly studied by 1H NMR spectroscopy. As shown in the partial 1H NMR spectra in CDCl3 (Fig. 1), only one set of peaks was found for the mixture solutions of the receptors and anions, indicating fastexchange complexation on the NMR time scale. The proton signals of 1:1 mixture of 2 and anions have significant shifts by comparison with the proton signals of free receptor 2 under the same conditions. The meso-phenyl protons H2, H3, and H4 on 2 obviously shifted upfield, while H5 of 2 sharply moved downfield, which indicated the existence of strong binding interactions between 2 and the above anions. Significant changes of the 1H NMR signals (Figs. S9 and S10 in Supporting information) were also observed upon the addition of tetrabutylammonium salts with different anions to the receptor either 3 or 4, indicating the formation of host-guest complexes. Fig. 1. Partial 1H NMR (500 MHz, CDCl3, 22 ℃) spectra of (a) host 2, (b) 2 + F-, (c) 2 + Cl-, (d) 2 + Br-, (e) 2 + I-, (f) 2 + NO3-, (g) 2 + HSO4-, (h) 2 + AcO-. The concentrations of 2 and anions in all samples are 5.0 mmol/L. Isothermal titration calorimetry (ITC) was then used to investigate anion recognition. The binding stoichiometries of three receptors and the investigated anions, such as F-, Cl-, Br-, I-, NO3-, HSO4-, and AcO-, in chloroform were all determined to be 1:1. The association constants (Ka) for the complexation of the tetraurea-appended receptors with anions were obtained by linear fitting based on ITC data (Table 1). 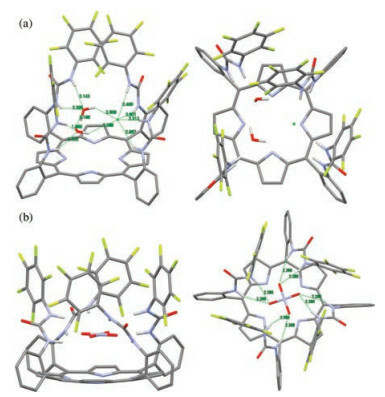 The highest Ka value was found to be 1.1 ×108 L/mol upon the complexation of the host 2 with HSO4-, probably because the tetrahedral configuration of HSO4- highly matches the spatial structure of the tetraurea-encircled cavity in hosts. Among three receptors, the association constants of the complexes of 2 with anions are the highest, whilst the association constants of the complexes of 4 are the lowest. This trend may be caused by the difference of electron withdrawing capability of the substituent groups on the phenyls of different receptors. The stronger is electron withdrawing capability of the substituent groups, the more acidic is N-H of the ureas. In general, more acidity on ureas leads to higher binding ability toward anions. Pentafluoro groups have the strongest electron withdrawing capability, so the receptor 2 exhibits the most effective complexation for anions. As the electron withdrawing capability of 4-ethoxycarbonyl and 2, 3-dichloro are in sequence, Ka of 3 are in the middle and Ka of 4 are the lowest. In addition, Ka of the receptors with F-, Cl-, Br-, and I- decreased successively, which is probably owing to the combined influence of the changes of halogen anion radii and electronegativity. Notably, the Ka of 2·I- in chloroform is 3.1 ×105 L/mol, while Ka of the complex 2·F- is 6.6 × 107 L/mol, about 200 times higher than that of the complex 2·I-. This difference of Ka implies that the receptor 2 has potential application as a selective sensor or extracting agent to F- against I-. ESI-MS studies provided further evidence for the 1:1 stoichiometries of complexes of the pocket-like receptors and anions in THF. No peaks were found for the complexes with other stoichiometries. For example, the relevant peak was found for the complex 3·Cl-: m/z 1473.4885 [3 + Cl]-, calcd. for C84H70ClN12O12 1473.4925, error -2.7 ppm; the relevant peak was found for 3·Br-: m/z 1517.4401 [3 + Br]-, calcd. for C84H70BrN12O12 1517.4420, error -1.3 ppm; the relevant peak was found for 3·NO3-: m/z 1500.5037 [3 + NO3]-, calcd. for C84H70N13O15 1500.5114, error -5.1 ppm; the relevant peak was found for 3·AcO-: m/z 1497.5258 [3 + AcO]-, calcd. for C86H73N12O14 1497.5369, error -7.4 ppm. Furthermore, the complexation between the receptors and anions were unambiguously confirmed by single-crystal X-ray analysis (Fig. 2, the X-ray analysis data are listed in Supporting information). The single crystals of 2·Cl- and 2·NO3- were obtained by diffusion of n-pentane to a solution of 2 and Cl- and a solution of 2 and NO3-, respectively, in chloroform at room temperature. As shown in Fig. 2, the host-guest complexes were stabilized by the hydrogen bondings between the urea units and anions. Interestingly, in the solid state of 2·Cl-, two water molecules were also encapsulated in the cavity of the host 2 as the bridges to fix the guest Cl- (Fig. 2a). Two hydrogens on the two water molecules and four hydrogens on two urea units of the host form six hydrogen bondings with the chloride anion, while the two water molecules form a hydrogen bonding each other and are captured in the cavity by the other two urea units via four hydrogen bondings. Whereas, in the solid state of 2·NO3-, the anion guest NO3- disorders on a plane to form almost unified hydrogen bondings with the four urea units of the host (Fig. 2b). The four urea units tightly fasten NO3- via eight hydrogen bondings between the eight N-H hydrogens of ureas and the three oxygens of NO3-. In summary, three tetraurea-appended porphyrin-derived anion receptors were synthesized and the recognition of these receptors with various anions was investigated by using NMR spectroscopy, ESI-MS spectrometry, ITC, and single-crystal X-ray analysis. These receptors showed strong binding abilities toward anions, such as F-, Cl-, Br-, I-, NO3-, HSO4-, and AcO-, with the binding stoichiometries of 1:1 and with the association constants of up to 1.1 ×108 L/mol. A decreasing trend of the binding constant, that caused by the difference of electron withdrawing capability of the substituent groups on the phenyls of receptors, was observed. Moreover, the large difference (more than 200 times) between the Ka values of the complexes 2·F- and 2·I- implies its potential application in chemical sensors for detecting F- against I-. The complexation of the receptors with anions was further unambiguously confirmed by single-crystal X-ray analysis. As shown in the solid states, the pocket circumfused by four ureas and the porphyrin plane is quite suitable to encapsulate anion guests, while the hydrogen bondings between the urea units and anions play a key role for the complexation of the receptors with anions. The development of this recognition motif provides new insights into host-guest chemistry with urea-based neutral anion receptors. This work was supported by the National Natural Science Foundation of China (Nos. 21572042 and 21773052), the Program for Innovative Research Team in Chinese University (No. IRT 1231), the Natural Science Foundation of Zhejing Province (Nos. LZ16B020002 and LQ17B040002), and the Public Welfare Technology and Application Program of Zhejiang Province (No. 2015C31141). Supplementary data associated with this article can be found, in the online version, at https://doi.org/10.1016/j.cclet.2017.10.029. H.W. Wu, Y.Y. Chen, C.H. Rao, C.X. Liu, Prog. Chem. 28 (2016) 1501-1514. P.D. Beer, M.G.B. Drew, D. Hesek, R. Jagessar, Chem. Commun. (1995) 1187-1189. R.C. Jagessar, D.H. Burns, Chem. Commun. (1997) 1685-1686. D.P. Cormode, M.G.B. Drew, R. Jagessar, P.D. Beer, Dalton Trans. (2008) 6732-6741.